Our drive to engage in this process is rooted in our long term aspirations for the future of Welwyn Hatfield. As a landowner with an historic attachment to the area it would be irresponsible not to engage with the Local Plan process. Gascoyne Cecil long ago concluded that one can either seek to engage and strive to improve the environment in which we all live, or adopt a negative or passive stance which will only result in further disappointment, and a justification of many peoples’ skepticism. We are uniquely positioned to deliver a properly considered contribution to the Local Plan for several reasons. In the past decade there has been much discussion on, and support for, the idea of a new Garden City as a means of meeting housing demand in Hertfordshire. That nothing has happened to date serves to emphasise the logistical challenges of such an undertaking. That is not to say a new Garden City is unachievable, but other alternatives must be sought as viable solutions for this Local Plan. This does not mean we ought to limit our aspirations. Gascoyne are seeking to deliver an alternative to bland or ugly housing developments which often lack the facilities needed to establish a sense of community pride and spirit. This might be derided as unrealistic. Yet the Prince of Wales’ work at Poundbury, Dorset was met with scorn in the beginning, whilst at the turn of the twentieth century Ebenezer Howard’s ambitions for a Garden City at Letchworth and subsequently at Welwyn Garden City were similarly maligned as being unworkable. All are now celebrated as successful models for best practice in their different ways. A new Garden City is not the only comprehensive or plausible solution. In 2008, the University of Hertfordshire hosted a ‘Hertfordshire Charrette’. The Charrette provided a chance for a diverse group of residents and professionals to meet and discuss the challenges faced across the county. Participants took the opportunity to work directly with a design team and produced six growth scenarios by which the county might accommodate growth. Building on these conclusions, Gascoyne Cecil have evolved a mix of proposals offering a variety of opportunities to create new mixed use neighbourhoods. As a long term stakeholder, Gascoyne Cecil have been intrinsically linked with Hatfield and the surrounding area for over 400 years. We must live with the consequences of our actions and therefore cannot build a development and simply walk away. We will never simply sell a site to a housebuilder, but instead will work with our partners to see the process is delivered to completion in accordance with the vision. Given the importance of the green belt, our belief is that as many of the 12,500 homes as possible must be built on brownfield land. This is a position shared by the Borough Council and the majority of residents. It is now clear, however, that WHBC can allocate only 6,500 homes within the Borough to brownfield sites. 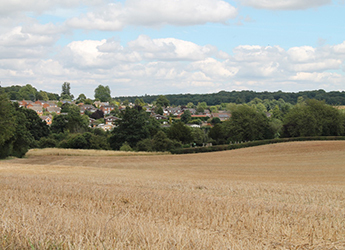 Given that most towns and villages are bounded tightly by green belt it is sadly inevitable that some reviews of existing green belt boundaries will be a key factor in the successful delivery of a new Local Plan. A Local Plan acknowledging the need to release land from the green belt as a measured response for the next few generations must be the correct solution. Such an approach allows good development to be carefully planned. It ensures it is of a good quality, and it can equal the better examples of historic development in Welwyn Hatfield. Green belt policy was established for compelling reasons. Today it is increasingly understood that strong mental and physical health requires access to green space. Our primary instinct is to nurture this space, to ensure that Welwyn Hatfield maintains its rich vein of historic park landscapes and masterplanned urban environments. Given that a small proportion of green belt land must be built on to meet housing demand, however, it is even more important that what is built is done well. As the planner, Andres Duany, said, “When green space is lost we lose something of value. We must ensure that what we get in return is of equal value.” We cannot accept the sacrifice of green belt land for sprawling housing estates or other substandard development. 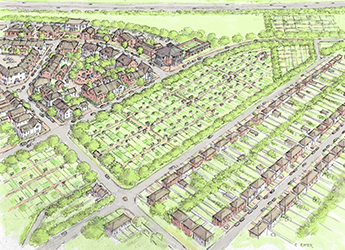 With well-designed mixed-use communities, however, whether a new village or an extension to an existing settlement, it is possible to preserve the local character and offer better access to green space than presently exists. Gascoyne Cecil are proposing several sites in the Local Plan. These work individually but have also been considered as part of a wider, sustainable package of responses to both housing demand and employment needs. In addition to these individual sites, we propose comprehensive strategies for green infrastructure – the creation of a recognisable green corridor. If carefully delivered, this has the potential to ensure Welwyn Hatfield remains an attractive environment in which people aspire to live, raise their families and work in generations to come.